This Sergio Lub style #739 Sumerian Queen handmade copper magnetic bracelet has two rare earth magnets and is made of pure metals. No plating is used and it is Made in USA. It is about 1/4" wide. I love all the Sergio Lub bracelets and have purchased many through the years. They are always attractive and very easy to slip on. They go with everything. I was very pleased with the service I received from the Magnet Jewelry Store, and would not hesitate to recommend them to a friend. Love the bracelet. It arrived promptly and I put it on and it was completely perfect. It fit correctly and looks wonderful on my wrist. Could not be happier with this bracelet. This replaced one that my wife wore for years that wore out and its even nicer ! Excellent bracelet, good quality and very nice looking. My wife loves it, and the healing benefits are great too. This is the 2nd bracelet I've purchased, this one for me the other for my husband.We both are very pleased, the bracelets are more than nice and we both feel the magnetic aspect is working for us.Free shipping is always a plus! Purchased this for my wife. 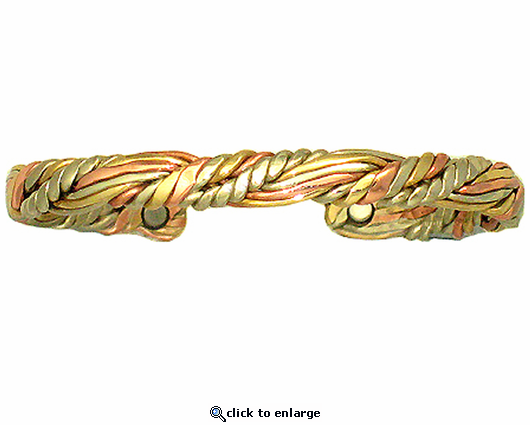 It is a VERY nice looking bracelet and seems to be very nice quality too. I got this beautiful bracelet for my arthritis, it works, plus I get craftsmanship and it fits perfect on my tiny wrist.....I never remove it even I'm in the shower,it remains shiny and looking new! I love my braceltet. It is beautiful, get lots of compliments and the service was great. I am going to order an ankle bracelet next and know I will be equally pleased. Copper Sage, Shepards Rope, etc.